When ever you think of Donuts the name Dunkin Donuts crosses ones mind . The American Donut giant has recently announced its plan to enter Indian bakery market with JV partner Jubliant Food works . Dunkin Donuts have presence in North America Europe , Asia , Latin america and approximately around 3000 outlets internationally. Donuts are new to India's palate even as we don't find any major Donut manufacturers in India . Now of course small & local bakeries have started experimenting with different varieties of Donuts . I was wondering whether India would have an answer to Dunkin Donuts and to my surprise I saw Donut Master retail cafe at Kingsway Camp , Delhi . Promptly I bought all kinds of Donuts (Chocolate , Straw berry , Orange and few Nips ) from that shop and product were really liked by all in my family . Donut Master thus can be our answer to DunkinDonuts. 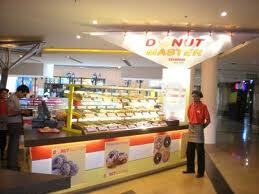 Donut Masters have presence in NCR and Gurgaon and are looking for further expansion .Donut Master is a brain child of Mr Ajit Raghav himself a Food Technologist and Ex - Dunkin Donut employee .